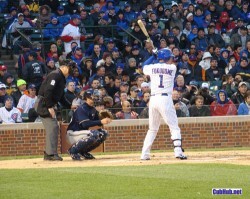 Last night in Houston, Kosuke Fukudome broke out in a big, big way. He went 4 for 5 plus a walk, including a double and a homer. Offensively this was his best game as a Cub, having last had a 3-hit game on August 25, 2008 and his only other 4-hit game last May 1st. Kosuke has looked consistently overmatched in every venue (regular season, playoffs, WBC, spring training) since about June 1st last year. Having a game like he had last night has got to be such a relief, such a release of pressure for him that I hope he will now snap out of his ten month stupor. I am really pulling for him. His is a great story, and frankly the club can use a boost from an unexpected place like from Kosuke. He really isn’t being counted on for much this year but I think we are all hoping for the best. Will this one game turn him around? Probably not, but hopefully it will let some of that air out of what has to be a balloon about ready to burst. No doubt the guy has a lot of pride. He hears the crowd, he knows how he just completely fell off the table last year, he knows Lou cannot afford to be as patient this year as he was last year. Fukudome is not a guy who wants to ride the bench, or as some have suggested, get sent down to the minors for some re-programming.